Augmented Reality (AR) and Virtual Reality (VR) are often believed to provide digital and off-field technology solutions. Generally, they are perceived as a tool for marketing, digital branding, audience engagement, education, retail promotion etc. AR and VR can be used in several sectors and context from manufacturing to fire and safety operations. Yes, AR and VR can be applied for several such Field Service Management (FSM) based work. AR and VR have a vast use case in this field. AR programs can be designed for product training, controlled simulations, emergency response and evacuation, remote access vision etc. AR/VR supports in cost reduction and saves man-power on these activities by enabling self-instructional images/videos. Apart from creating an immersive experience, it creates a personal walkthrough assistant for people out in the field. AR/VR can transform the way we respond to an emergency. In some cases, information on people trapped inside building can be checked via sensors and visual over-lays. For Fire & Safety evacuations, AR/VR provides instructional walk-throughs and directs to access points proving information on their current situation. Building heavy machinery and ships are very time consuming and requires large volumes of handbooks to train, record procedures for cross-reference. Using AR to prompt tools and display the procedure to assemble them saves several man-hours and creates an almost-error free assembly of the products. For some business as usual, AR/VR can reduce workflow time on inspection & maintenance and assist in detecting errors. Since 2011, Airbus has been using AR technology to improve efficiency in its quality control. Using its Supply Augmented Reality Tool (SART), Airbus employees can use visual overlay images on real systems to identify the faulty parts for repair. These kind of AR activities save time in creating an incident report and follow ups by enabling on-the spot solution. Often, it takes time to locate the right aisle/stack whilst arranging or onboarding goods. In 2015, Logistics firm DHL tested an AR program to manage stacking at a Netherlands inventory. The pilot proved that AR ‘vision picking’ resulted in 25% increase in efficiency. The staff worked with VuzixM100 that used Ubimax’s xPick software to assist the task. Staffs reported faster and error free task completion using these. Get in touch with us to know about using AR for your business! Appearition Pty Ltd is very excited to announce their new partnership with Vicomtech-IK4. Vicomtech-IK4 is an applied research centre, based in San Sebastián Technology Park. It was founded in 2001, and specialises in Computer Graphics, Visual Computing and Multimedia technologies. Similarly to Appearition,Vicomtech-IK4 aims to respond to the innovation requirements of its clients. This partnership will enable Appearition to continue delivering leading edge solutions to our clients, whilst simultaneously granting us access to individuals leading the world in the field of augmented reality. Conducts applied research and develops multimedia visual interaction and communications technologies. Complements and closely collaborates with industry, universities and other technology centres. Promotes mobility and training for its researchers. This takes the form of around a hundred applied research projects per year (carried out with industries and authorities on a local, national and European level), approximately 100 researchers and a yearly turnover of 7 million euros. Vox Lumen: People into Light was a live performance collaboration between Deakin Motion.Lab, Centre for Intelligent Systems Research (CISR), AppeARition, and Federation Square that transformed the heart of the City of Melbourne into a visual wonderland. 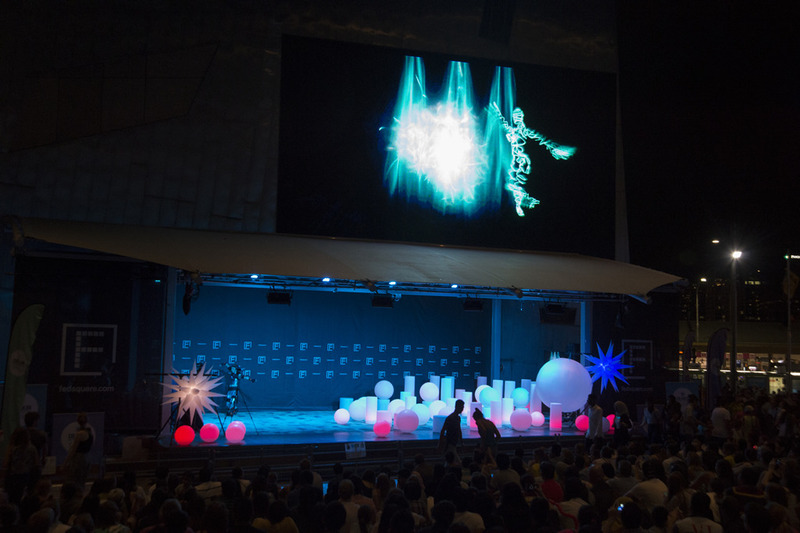 A series of abstract digital projections and live dancer-driven motion capture merged to create a 12-hour event that lit up the iconic Federation Square. The app is free to download from Google Play and the iTunes store.